He is honest, straight forward and works hard. The other two are simply creations of PR spinning doctors who combine fantasy with drops of the occasional reality. Reality, in this instance, comes from having done the job. The other pretender, Cameron, looks as real with his image as I am Swedish. 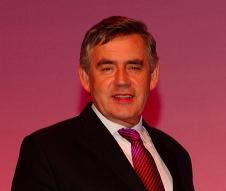 Gordon Brown had something to do with the current financial crisis but he took immediate action to ensure that the economy did not collapse like it did in Greece. He can be trusted and will be the best person to get the country out of the recession.